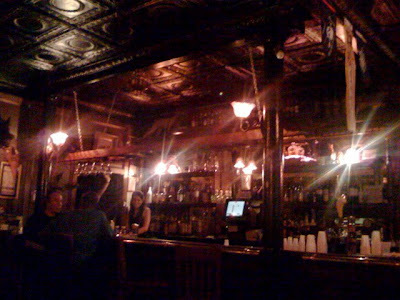 This is the view of the bar at the Blind Tiger Pub on Broad Street in Charleston, SC. It was the beginning of an adventurous Friday evening. 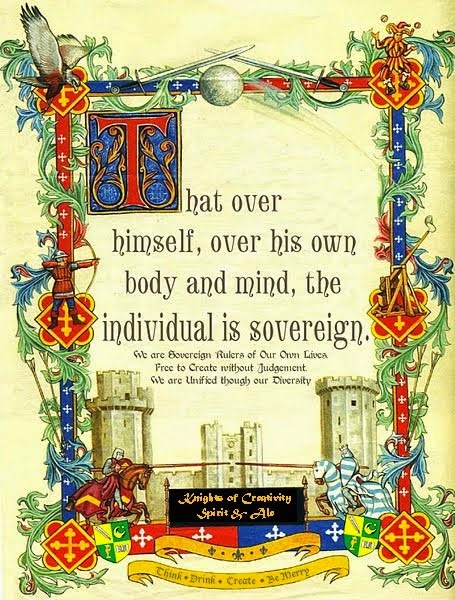 The gentlemen at the bar were talking about the Knight's favorite subject...Unity through Diversity. Actually they were discussing how they represented minorities. The Jew, the Gay Guy, the Woman and the Black Man. I bellied up to the bar to remind them that they represented the beauty of Unity through Diversity, and that by being Unified through our Diversity we become the Majority...morality (as defined by the RIGHTeuos) or not! That's when we discovered Magic Hat #9! 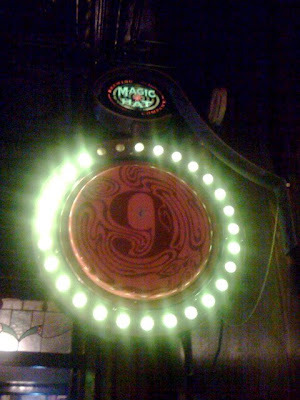 Magic Hat #9 was lit over the entrance to the bathroom's. I enquired as to what this intriguing beer was. It is an English style Pale Ale, but lighter than a regular pale ale, brewed by Magic Hat Brewery in Vermont. It produced an evening experience which was a cross between the Beatles "Revolution #9" from the White Album and the Mad Hater from "Alice in Wonderland". It was only a preview of the coming attractions! 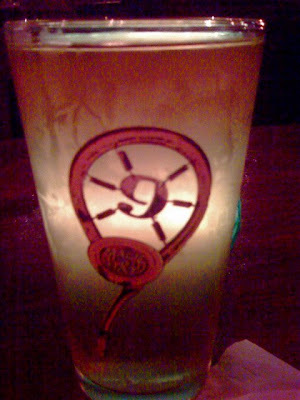 Here is Magic Hat #9 in all its Amber Glory! Magic Hat #9, the ticket to Paradise and an alternative universe habitated by Giant Mushrooms and talking Worms. Of course, the occasional Frat Party hosted by ex "Duke" La Cross players sneaks into the story, which produces the "3 Alarm Party". 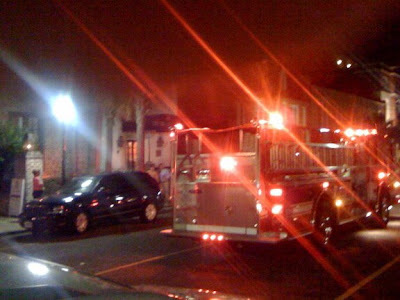 Charleston's finest, Ladder Number 9, ironically, show up to our B&B in Charleston on the Vendue Range in the French Quarter between the River and East Bay Street at 3am. Not only was I reminded of Hillary's famous, or is that infamous, commercial on getting the 3am call at the White House, but we actually lived through the experience. It appears that these "Duke" graduates, who were attending an upcoming wedding , decided that they would have a party and smoke in several rooms in a non-smoking building. The result was obvious! ...the Sanctuary at Kiawah Island, 20 minutes south of Charleston. 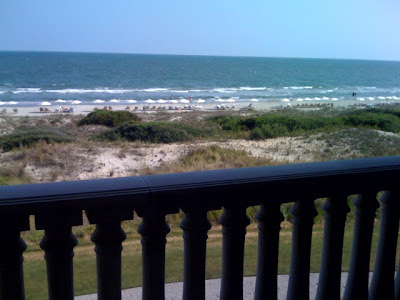 Kiawah is where we always brought our kids on Summer Holiday since 1993. The Sanctuary is a relatively new 5 Star Resort. This is the view from our Beachfront Suite, Room 277. 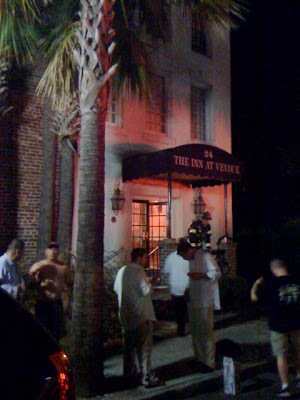 Not too bad for a couple of Magic Hatter's escaping a 3 Alarm Charleston Fire! Best of all, we don't have to wear a hump back and cry out all night long, "Sanctuary, Sanctuary!" 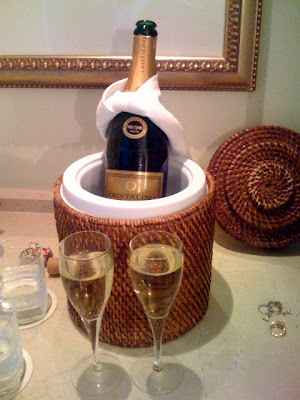 Of course, being our 24th Anniversary, we where treated by the hotel staff to a bottle of very fine Spanish Brut Champagne. Perhaps a slight step up from Magic Hat #9, but non the less just as effective. It appears that with all the drama, trauma, and general hilarity we have caused each other and you, our loyal readers, because of our son going through Basic Training, we have realised that life goes on, and what a wonderful life it is as long as you are brave enough to live it! So with that, Lady Allwinky and Sir Hook bid you God Speed as you discover the joy that shines through the clouds of your life, as we have once again on our annual pilgrimage to South Carolina, home of loyalists, rebels, movers, shakers and colonial candle stick makers. 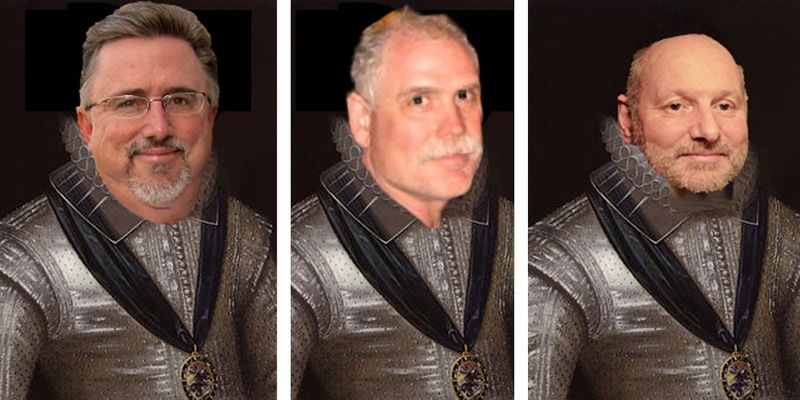 That is one wild Knight(s) on the town! If nothing else, this little society has gotten us to think in times of adversity, "Wow, this will make a great blog!"